Help Pencils of Promise (PoP), a non-profit, win $1 MILLION on Facebook! Why help PoP? 1) PoP builds schools for some of the most impoverished children all over the world! 2) Education is a basic human right! 3) Over thirty Brown alumni are involved with PoP! Let's support our Brown alumni! A GENERATION EMPOWERED WILL EMPOWER THE WORLD. Once you have voted, please forward the link to as many people as you can. The organization with the most votes by Jan 22nd wins! It's simple and a great way to spread social good! What is Pencils of Promise? Founded by Adam Braun, Class of 2006, Pencils of Promise works to bring sustainable education to the most under-served children in the world. With the opportunity and knowledge that an education provides, we can begin to eradicate the forces of poverty, disease, and discrimination. Working side by side with local partners, we create empowering schools, libraries and dormitories that the entire community can proudly call their own. Pencils of Promise is our opportunity to join together. Through our collective skills and perspectives, we've created something far greater than just the sum of our parts. By uniting in our desire to create meaningful good, we have the ability to empower the world. In just over a year, we built three primary schools in Laos, established partnerships with three other non-profits, raised over $125K through grassroots effort, and have over 50 members, 200 volunteers, and over 10,000 online supporters. We plan to build more schools and expand into Africa and Central America in 2010. How you can support PoP's vision and mission: We have the chance to win $1,000,000 through Chase Community Giving on Facebook by simply having the most "votes" on Facebook from January 19 - 22. 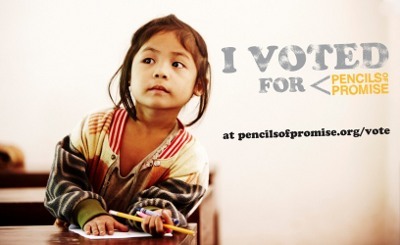 All you need to do to help us reach our goal and win the $1M is visit www.pencilsofpromise.org/vote and click vote. We need everyone’s help in order to reach our goal so please forward this email along to your friends, family and colleagues. One million small acts to win one million dollars through Chase Community Giving. If we win the $1 million, we will donate at least $100K to youth projects in Haiti.